Eclairs today are to Paris what cupcakes have been for the past half-decade to the U.S.—the latest dessert trend. Sure, there are many French pastries and baked goods that are eaten far more often that eclairs by Parisians. Macarons chiefly come to mind, but there are also madeleines, financiers and even croissants and pain au chocolat, all of which are perennial favorites in the City of Light. 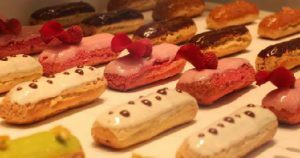 But much as the humble cupcake rose to beloved status in the U.S. and spawned an entire cottage industry of elaborate, inventive cupcake creation, so has the ordinary eclair led to a revolution in crafting these torpedo-like pastries in Paris. 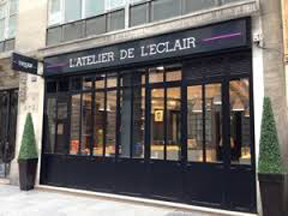 One of the best places in the city to experience this new fad is L’Atelier de l’Eclair (The Eclair Workshop) in the Montorgueil neighborhood of the 2nd Arrondissement. 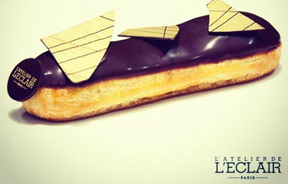 Opened November 2012 by business school graduate Guillaume Simonnet and two other business partners under the creative direction of master patissier Loic Bret, L’Atelier de l’Eclair aims to completely reinvent a simple dessert many French adults consider strongly linked to their childhoods. “If the French love the eclair so much, it’s because it’s the first pastry we chose as children,” Simonnet told The Financial Times in early 2013. And because the dessert is a childhood favorite, most pastry makers in France simply reproduce the simple versions they remember loving as kids—custard-filled and glazed with chocolate, vanilla or coffee icing. “Maybe it seemed too simple a cake” to experiment with, Simonnet told the British newspaper of the very few changes to the eclair seen over the many decades since it became popular throughout France. But experiment the patissiers at L’Atelier de l’Eclair decided to do, and they’ve come up with countless combinations of ingredients that result in a never-before-seen array of both sweet and savory versions of the classic pastry. Regular sweet eclairs sold at the shop include dark chocolate, salted butter caramel, mango and passionfruit, red berries, lemon meringue (topped with a toasted meringue crust), Speculoos with white chocolate, hazelnut mousse, vanilla with raspberry, and green apple. You can even buy foot-long versions of the chocolate, lemon meringue and red berry eclairs. And that list doesn’t include many sweet seasonal offerings and “eclair du jour” creations, such as mandarin orange, nougat, Nutella, and a winter-themed Mont Blanc (chestnut cream) modeled after the classic French pastry of the same name. No matter how often you visit the shop, you’re treated to new sweet treats cooked up by the patisserie’s crack baking team, which includes many young patissiers who trained in some of Paris’s top bakeries and restaurants, including the venerable Plaza Athenee hotel. But inventive as some of those sweet treats sound, the real innovation has been in the crafting of several savory eclairs. Daily offerings include foie gras with figs, salmon with dill, chorizo with sun-dried tomatoes, goat cheese and pesto, and ham with Comte cheese. The staff even takes the shells for the foot-long eclairs and split them to make several tasty sandwich offerings: Italian, ham with Comte cheese, Mediterranean, chicken curry and vegetarian. And you’re definitely not getting a mass-produced product at L’Atelier de l’Eclair: All of the pastries are made fresh daily, and nearly 100 percent by hand. In fact, the only product that is not prepared by hand is the pastry cream used to fill the sweet desserts. The team uses a mixer for that, and only because the patissiers want to make sure the dessert filling is free of any lumps, no matter how small. Everything else is stirred, churned, rolled and cut the old-fashioned, tried-and-true way. Clearly, these aren’t the garden-variety eclairs you will find at any corner pastry shop in Paris—nor are they the desserts the French reminisce about from their youth. They’re on the cutting-edge of the recent Renaissance in French gastronomy that aims to reinvent the nation’s classic dishes—from soups, starters and main plates to desserts and breakfast pastries. 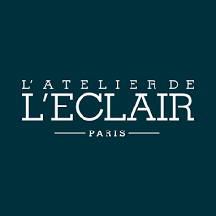 Lucky for us, we get to taste that Renaissance whenever we want simply by visiting L’Atelier de l’Eclair. Hours: Monday-Saturday, 11:30 a.m.-7:30 p.m. 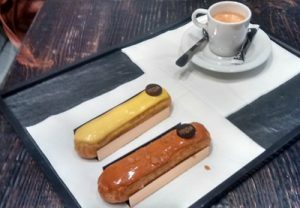 This entry was posted in Food, Patisseries and tagged Eclairs, L'Atelier de l'Eclair, Montorgueil district by Bob Adams. Bookmark the permalink.